Brandeis Theater Company joins the international celebration of Stephen Sondheim’s 80th birthday with his musical "Sunday in the Park with George" directed by Elliot Norton Award winner Scott Edmiston and musical direction by Todd Gordon. On stage will be Brandeis faculty members Nancy Armstrong and Pamela Wolfe among a cast of 65 student performers. The Brandeis University School of Creative Arts, comprised of the departments of theater, music and fine arts, come together for five performances running Nov. 18 - 21 in the Spingold Theater Mainstage. Stephen Sondheim’s landmark musical about the life and work of painter Georges Seurat and his most famous painting "A Sunday Afternoon on the Isle of La Grande Jatte" come to vivid life in this large and lavish production. Designers for the show include: sets by Carlos Aguilar (MFA’11), costumes by faculty member Charles Schoonmaker, lighting by Ben Williams (MFA’11), sound by faculty member David Wilson and projection by Erik Pearson. Book by James Lapine. Georges Seurat’s life is largely fictionalized in the musical. In the play, Seurat obsessively works on what would become his masterpiece using a pointillist painting technique that requires dedication and little room for anything else, most notably his muse and lover Dot. Act One closes with the finished painting but not much else for Georges. Act Two is set 100 years later, in 1984 and finds Seurat’s great-grandson and namesake struggling to survive and connect as an artist, examining what it means and what it takes to thrive in a subjective world. His future is linked to his past, as the ‘people in the painting’ reach out across time to inspire to the young George, propelling him forward. "Sunday in the Park with George" Director Scott Edmiston is among the Boston area’s most sought-after and honored directors, having received three Elliot Norton awards for his work which spans collaborations with Speakeasy Stage Company, American Repertory theater, Lyric Stage Company, Opera Boston and the Huntington Theater Company. 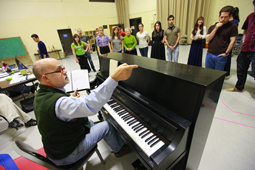 Musical Director Todd C. Gordon has served as Musical Director for New Repertory theater, Publick theater, Stoneham theater, Gloucester Stage and Emerson Stage; he has received two IRNE awards for his work throughout the region. • Thursday, November 18 at 7:15 p.m: Professor of Art History and Fine Arts Department Chair Nancy Scott offers a pre-show talk about the life and work of painter Georges Seurat in the Dreitzer Gallery in the Spingold Theater Center. • Saturday, November 20 at 1:00 p.m: Tour and gallery talk at the Rose Art Museum featuring works in the current "Regarding Painting" exhibit by curator and Director of Academic Programs for the Rose, Dabney Hailey. • Saturday, November 20 at 4:00 p.m: Post-show discussion with director Scott Edmiston, immediately following the 2:00 p.m. performance. Pamela Wolfe is celebrating her 25th year of vocal instruction at Brandeis University; she has been featured in numerous musicals including "The Pajama Game", "She Loves Me" and has been a featured soloist with the Boston Pops. Her career also features multiple appearances in operas including "La Bohème", "Die Fledermaus" and "The Merry Widow". Tickets for "Sunday in the Park with George" are $18-$20 and are available through Brandeis Tickets at www.brandeis.edu/tickets or by calling (781) 736-3400. More information about the production and the Brandeis Theater Company can be found at www.brandeis.edu/btc. Performance dates and times are Thurs. Nov. 18 at 8:00 p.m, Fri. Nov. 19 at 8:00 p.m, Sat. Nov. 20 at 2:00 p.m, Sat. Nov. 20 at 8:00 p.m, Sun. Nov. 21 at 2:00 p.m.
"Sunday in the Park with George" is made possible with support from the Robin, Barbara and Malcolm L. Sherman Endowment for the Performing Arts, the Laurie Foundation and the Brandeis Arts Council.